You know Portland, Oregon is the epicenter of craft beer. That’s an indisputable fact that somehow gets disputed constantly. You could certainly make an argument for San Diego, and Asheville has its charm, but Portland is…well, Portland. And Cascade Brewing is one of the many reasons Portland earns the honor. 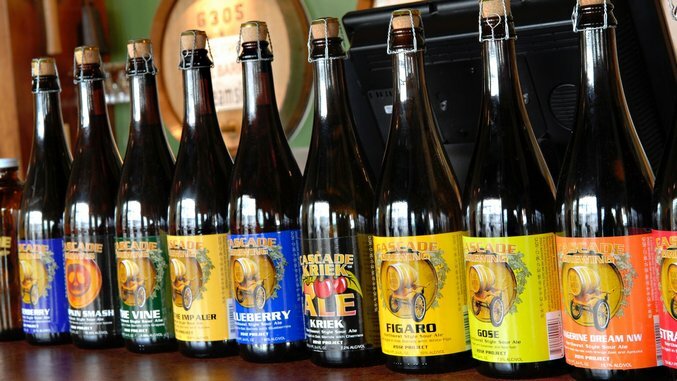 In 1998, Cascade started out by brewing northwest IPAs like everyone else in town, but the founders quickly became obsessed with sours, capitalizing on the resources that were abundant from local wineries and fruit growers. They went “all in” on the sour movement in 2010, opening the Cascade Brewing Barrel House, a 7,000 square foot production facility and taproom that’s been dubbed “the house of sour.” Over the past decade, Cascade has perfected the art of blending and barrel aging and in the process, has helped to usher in the sour beer trend here in the U.S.
Cascade has spent the last year systematically expanding their distribution footprint, and recently announced an expansion into 12 new states ranging from Alabama to Maine to Ohio. They’re even going global, announcing earlier in the year that they would start distributing beers in the United Kingdom. So there’s a good chance that you’ll start seeing Cascade’s brews on the shelf of your local beer store. We’ve picked five of our favorites from Cascade Brewing here. But don’t fret if you don’t see something that strikes your fancy. The brewery has a deep portfolio that showcases a ton of different fruit varieties. So if there’s a fruit that really blows your mind, check Cascade’s rotating list of available beers and seek it out. You won’t be sorry. Cascade ages different blonde ales in oak wine barrels with fresh apricots for more than a year, then blends them together with some barrels of un-fruited blondes for balance. There’s no mistaking the taste here—it’s full of apricots, with a tart finish and a hint of oak. It’s 7.2% and available in 750ml bottles, like all of Cascade’s wares. There’s “sour” and then there’s Kriek. Cascade blends sour red ales that are aged with both Bing cherries and sour pie cherries for up to 17 months. If Cascade has a flagship beer, a calling card, this is it. The beer changes a little each time Cascade brews and ages it and the latest version is extremely fruity; they used more than 16,000 pounds of cherries for the latest batch, and many say it’s the best version Cascade has produced to date. This red ale is one of those super limited releases you have to do some digging to find. You’re looking for the last batch from 2013, which was aged with Cabernet Sauvignon grapes in Cabernet and Port wine barrels for more than two years. Are you impressed yet? It’s hella complex, with a schizophrenic flavor profile that ranges from leather (but in a good way) to cherry and packs plenty of acidity. Mmmm, blueberries. Cascade mixed some wheat ales and some blonde ales, all of which were aged with fresh blueberries for a year and the result is an intensely “berry” ale that delivers plenty of sweet fruit balanced by the tannins of the oak barrel. Cascade prides itself on creating complex beers, but this Blueberry Ale is about as straight forward as a well-aged sour blueberry ale can get. Typically, I’m suspicious of beers that are modeled after cocktails, even if I’m a huge fan of that cocktail. I’ve been burned before. But Cascade’s Manhattan NW delivers in its own, fruity way. The bourbon barrel-aged blend of sour quads and blonde ales dishes notes of bourbon and maraschino cherries and even has a surprising sweet side, just like its name-sake cocktail. The beer was a 2014 project, and Cascade insists it will get better with age. And watch out—it’s 9.6% ABV.